Today, the stores look is scary, scary or rather look at the price tags. Oh, I do not know how long it will last and in my heart I believe that one of the subsequent tomorrow will bring us the price as before, or even lower. But my optimism unfortunately assumptions analysts and reality put into place. Well, one must live for today and today the prices a little bite, buyers choose carefully not only what to buy, but also where to buy. The question where I certainly will not tell you exactly, but I think it is obvious that it is necessary to buy, where cheaper. But the question of what to buy, perhaps, be able to give a little hint. Dear reader, perhaps you might be interested in the hero of today’s article. 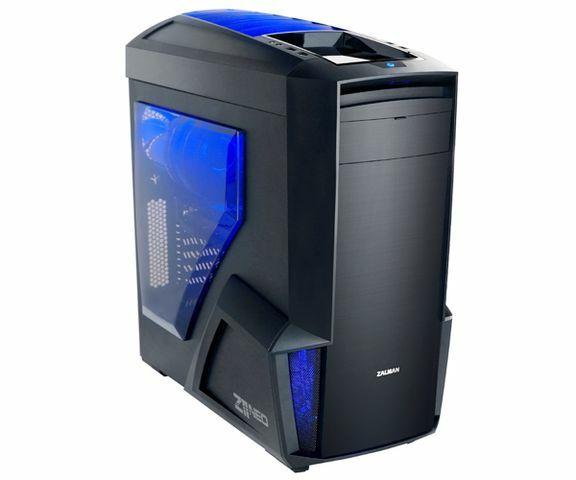 I suggest you look at a pretty good and pretty functional cabinet Zalman Z11 Neo. This body comes in a large cardboard box on which there is an abundance of information about the characteristics of the content. The housing is protected from damage foam blocks. 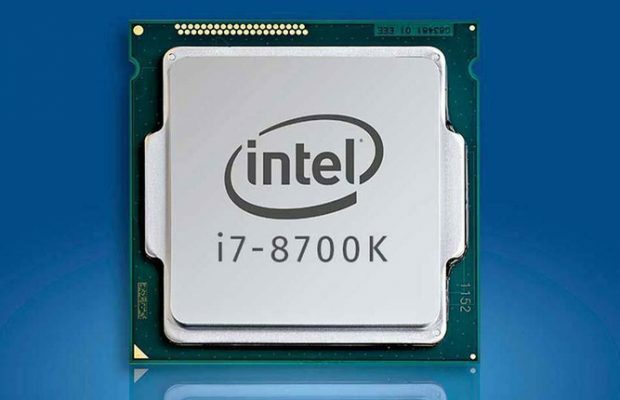 Scope of delivery is quite modest, it has everything you need to build a PC, and even a little more. Included with the package that contains the screws and clamps present extension 4 + 4Pin CPU power. Appearance is quite impressive, but really I must admit on this chassis designers have worked very well. The sides of the present extensions are made of plastic and looking ahead, I want to say that they are under 80mm fans on each side. As slotted extensions for hot air output. Continue to review the front panel, it is made of plastic, it is present sulfuric metal insert and the top one compartment to the external 5.25 “device. The compartment closes the shutter, it goes down pretty easy. On the back side of the photo you can see the power supply is lower, for blowing hot air meets the 120mm fan, there are two slots for hoses LSS. There are seven expansion slots for PCI-e slot devices and the rear panel of the motherboard. The top panel is made of plastic and has a very interesting design. 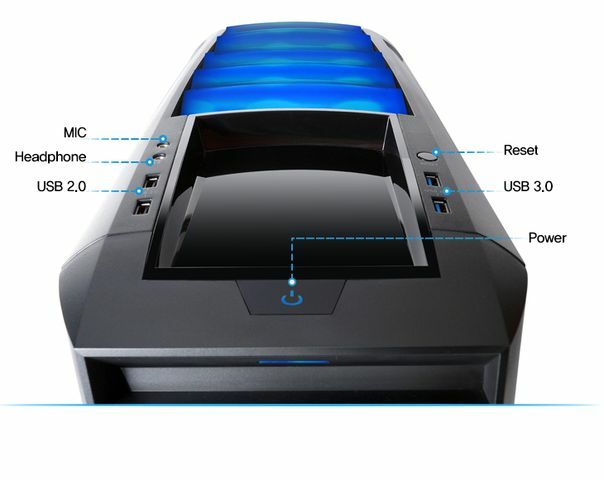 Also on it are located on and reset buttons, audio outputs, a pair of USB 2.0 and a pair of USB 3.0. All of this is located in between the two lines are present glossy plastic groove that can be used to store anything, it’s pretty convenient but ultimately not practical. After all, glossy surface not only brand, but is easily scratched, so that nothing metallic there better not put. Also in the rear part of the upper panel is provided with special ventilation slits, which are made of transparent plastic floor, underneath the fan is seen from the backlight, and further there is on the top panel of a metal mesh insert. All this must be the very beautiful night to shine. 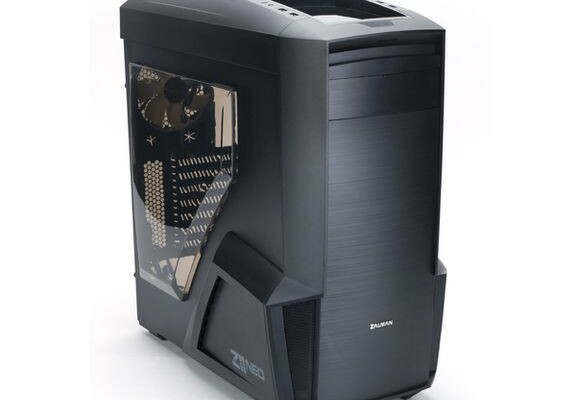 At the bottom of the case, there is protection against dust. Separate removable dust filter with plastic frame under the fan and dust filter for the power supply in the form of a perforated sheet of thin plastic. To begin with a look at the side walls. On the left, there is a fairly large convex darkened window. Box made convex for installing high CPU coolers. On the plastic extension at the bottom of the housing there is an inscription Zalman Z11 Neo, and by extension from the inside you can see the 80mm fan, which is connected via a standard MOLEX. All of the above can be attributed to the right side wall, with the exception of the window and the inscription on the expansion. Plastic build-up, easy to remove, it is mounted on a pair of latches and screws. Inside, we are waiting for a thin 80mm fan c labeled Zalman ZA8015ASL, fans are mounted on each side, working on blowing. Before moving on to the internal structure and features, I propose to remove the front and top panel and look at their structure in more detail. Both panels are removed easily, first remove the front, and then only the top. The very front panel is made of plastic, but its outer side has a metal insert on which the company logo is present at the top of the shutter covering the external 5.25 “drive bay, as well at the top you can see a small LED. At the bottom of the widened portion of the insert contains metal mesh, they will be carried through the air intake fan located behind the front panel. On the inside of the photo you can see how to make the mechanism curtain is fairly simple, but the design looks a little safe. The top panel has been described previously, with its removal of any stand out features not found. 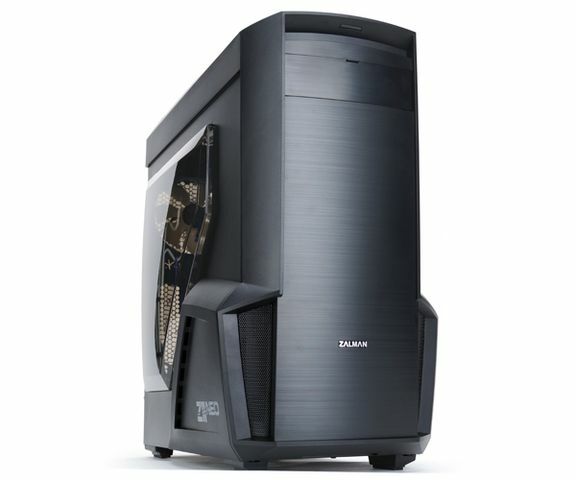 The internal structure of Zalman Z11 Neo pretty standard for a modern ATX case, but still has some of its features. The lowest basket attached to the bottom of the housing with 4 screws. Just next to the Shopping Cart is the stand, which I would recommend dismantling when installing video cards longer than 290mm, this stand is fixed for a couple of screws. The body has three 5.25 “bays, one of them only is external and the other two internal, and within them are the pair of metal sled that can be set in 3.5 / 2.5” drives. For the power supply provided rubber antivibration legs, and next to the PSU can be set to 120 / 140mm fan. In the motherboard tray has a slot for that would gently thread the cable from the power supply, only the rubber inserts in them is not provided. 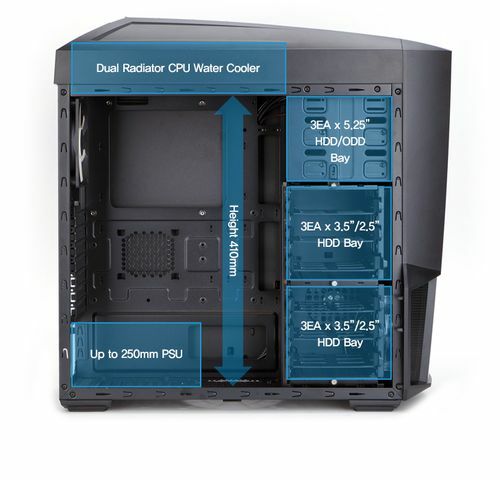 Cutout processor is quite large, it will replace the cooling system without removing the motherboard. 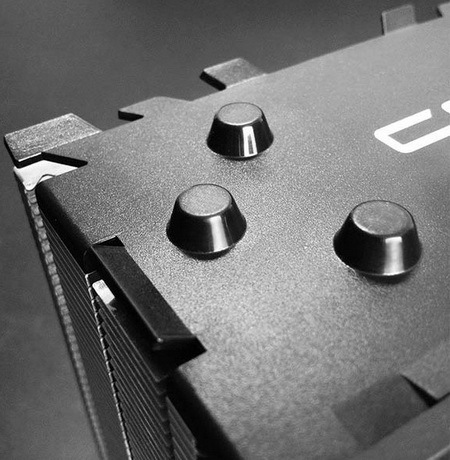 The manufacturer has provided additional bracing for one 2.5 “drive with the back of the motherboard tray. Located on the front of the particulate filter and place To install two 120mm fans and one 240mm radiator. The filter can be easily removed with cleaning it a problem should arise. 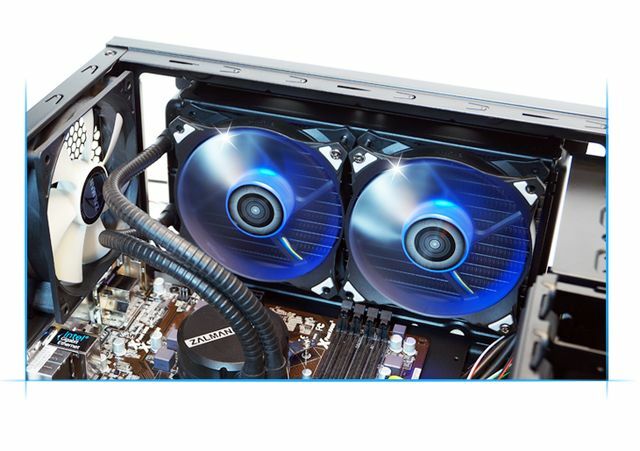 Initially, the front panel has a single 120mm fan marked ZA1226CSL.This fan is different from the rest 120mm fan so that it has an additional marking 4PS, which means that it connects via a standard MOLEX and runs at a constant speed 1200Ob / min. For blowing hot air out of the housing meets the 120mm fan at the rear of the cabinet. His marking ZA1226CSL, but he was deprived of illumination and is connected via 3pin connector, as evidenced by the letters SL. Its maximum speed is equal to the 1200th / min. At the top of the unit is 120mm fan with blue LED light, its labeling ZA1226CSL SL suggesting TX identical to the previous fan.On the upper wall can be installed, a pair of 120 / 140mm fans. Manufacturer raised further up the compartment with mounts for fans by making it possible to install radiators LSS compartment can easily install 240 / 280mm radiators. I want to say a little about the cooling system installed 120mm fans for blowing pretty quiet, they work at a rate of 900ob \ min. motherboard, they are connected via 3pin connector. 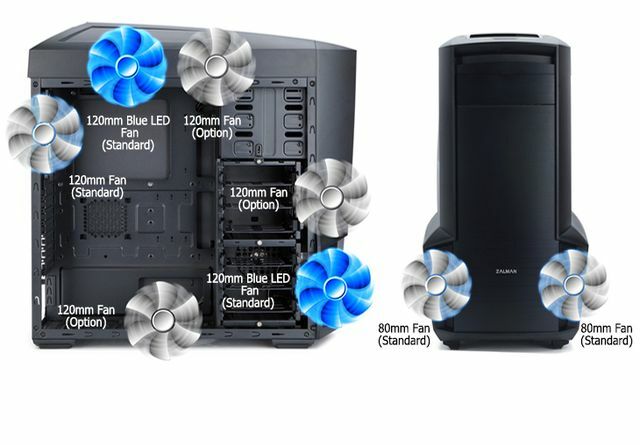 Just 80mm fans are also very quiet, their work is not heard in principle, they are connected by MOLEX. But mounted on 120mm fan blowing through a plug MOLEX clearly stands out from the background, creating a relatively high level of noise in their 1200ob \ min. Assembly in the housing is easy and convenient. 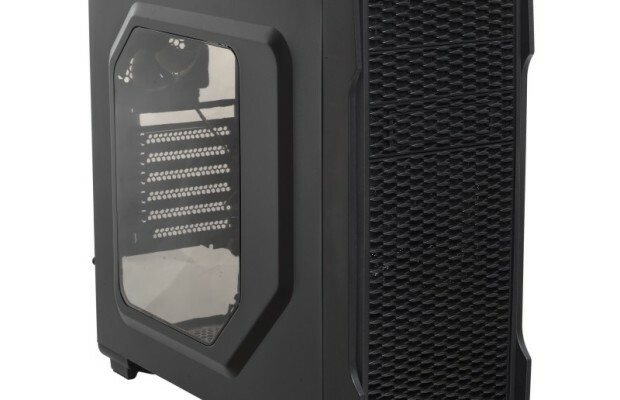 No difficulties have arisen in the process, building houses the size ATX motherboards without problems, the length of the power supply can be up to 220mm, all cables can be neatly hidden. 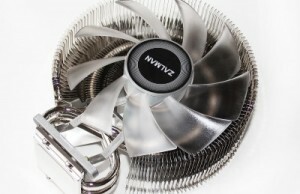 The height of the maximum CPU cooler can be 175mm and the length of the video card with a basket of not more than 285mm, without upper basket length can be 4000mm. On the reverse side is enough space to lay wires neatly. Lights not quite darkened plastic constrains at the proper level brightness insane fans. Through the mesh side extensions barely can see the blue light of the front fan. In its price range the body looks very good, it has a very interesting appearance, functionality and an interesting cooling system with the ability to build a good life-support system. Yes indeed it seems to be true, the case is good, and the thin steel ~ 0.75mm is not a bad thing, it is a measure by which we get an inexpensive product. Only disappointment noisy front fan. The rest of the body is available, handsome, thoughtful and maintains a good balance of price / performance though its predecessors are slightly cheaper.